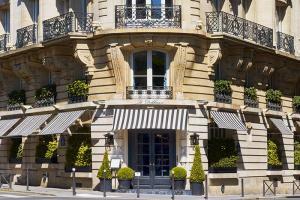 Nestled in the storied 16th arrondissement, Le Dokhan's, a Tribute Portfolio Hotel, Paris encapsulates the charm of the City of Light. Embrace classic French style in one of the 45 immaculately designed guest rooms or enjoy chic Parisian apartment-style suites, featuring the amenities of a well-appointed home. Socialize and sip drinks at Bar Le Dokhan's, Paris' first cocktail bar. This hotel affords striking views of the Eiffel Tower and is well located to popular landmarks including the Trocadero, the Champs-Elysees and the Palais Garnier. Located in Paris' 16th arrondissement, approximately 12 miles from Charles de Gaulle International Airport and 10 miles from Orly Airport.